Many tens of thousands of school practitioners and teachers (K–12) have benefited from the step-by-step guidelines and practical tools in this influential go-to resource, now revised and expanded with six new chapters. The third edition presents effective ways to assess students' strengths and weaknesses, create supportive instructional environments, and promote specific skills, such as organization, time management, sustained attention, and emotional control. Strategies for individualized and classwide intervention are illustrated with vivid examples and sample scripts. In a large-size format with lay-flat binding for easy photocopying, the book includes 38 reproducible forms and handouts. Purchasers get access to a Web page where they can download and print the reproducible materials. *Chapter with guidance and caveats for developing individual education programs (IEPs), 504 Plans, and multi-tiered systems of support (MTSS). *Chapters on working with students with attention-deficit/hyperactivity disorder (ADHD) and autism spectrum disorder. *Three guest-authored chapters describing exemplary schoolwide applications. *More student centered--provides a template for involving children in intervention decision making. *Fully updated with the latest developments in the field. Peg Dawson, EdD, is a staff psychologist at the Center for Learning and Attention Disorders in Portsmouth, New Hampshire, where she works with children and adults. Dr. Dawson is a past president of the New Hampshire Association of School Psychologists, the National Association of School Psychologists (NASP), and the International School Psychology Association, and a recipient of the Lifetime Achievement Award from NASP. With Richard Guare, she is coauthor of bestselling books for general readers, including Smart but Scattered, Smart but Scattered Teens, and The Smart but Scattered Guide to Success (with a focus on adults). Drs. 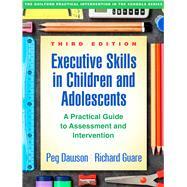 Dawson and Guare are also coauthors of The Work-Smart Academic Planner, Revised Edition, and books for professionals including Executive Skills in Children and Adolescents, Third Edition. Richard Guare, PhD, is Director of the Center for Learning and Attention Disorders in Portsmouth, New Hampshire. Dr. Guare's research and publications focus on the understanding and treatment of learning and attention difficulties. He is a neuropsychologist and board-certified behavior analyst who frequently consults to schools and agencies. With Peg Dawson, he is coauthor of bestselling books for general readers, including Smart but Scattered, Smart but Scattered Teens, and The Smart but Scattered Guide to Success (with a focus on adults). Drs. Guare and Dawson are also coauthors of The Work-Smart Academic Planner, Revised Edition, and books for professionals including Executive Skills in Children and Adolescents, Third Edition.